It’s almost Valentine’s Day! That means it’s time to find that perfect gift for your very special someone. We’ve listed the top 5 Must Haves for Valentine’s Day 2015! First, what exactly is Valentine’s Day? By the 18th century, the tradition of giving gifts and exchanging hand-made greeting cards on Valentine’s Day had become common in England. Valentine cards were made of lace, ribbons, and featured cupids and hearts. Eventually the practice spread to the American colonies. The tradition of Valentine’s cards did not become widespread in the United States until the 1850s when a native of Worcester, Mass., Esther Howland, began mass-producing them. Today, of course, Valentine’s Day has become a booming commercial success. According to the Greeting Card Association, 25% of all cards sent each year are valentines. This gift box isn’t your typical box of chocolates. You can actually know what is in the center before you take a bite. Yeah, it kind of removes the element of surprise, but the pieces are bigger! 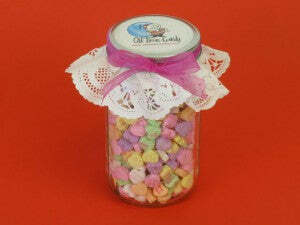 Filled with all of your favorite combinations; fruit, nut, nougat and our favorite. 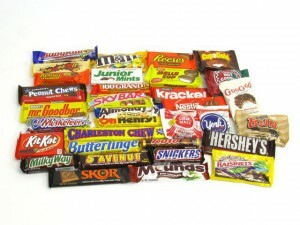 more chocolate! This will always be a winner with your lucky valentine! This is a really cute idea for your favorite Sugar Daddy. These aren’t for sale but are super easy to make. 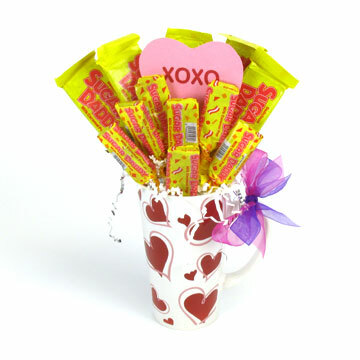 Just stuff a cute coffee mug with crinkled paper and arrange your favorite retro caramel sucker, the Sugar Daddy, like a bouquet! This Valentine craft was fun and quick to create. We used conversation hearts, a foam heart, and hot glue. The wreath could easily be made in an edible version too! Just cover the foam wreath with ribbon or plastic wrap before attaching the conversation hearts. 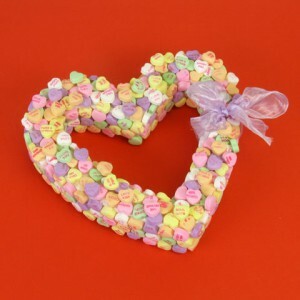 When attaching the hearts use a thick frosting instead of the hot glue! Impress your retro loving Valentine with a few Retro Toys! Maybe they could be musical with a Kazoo or a Tin Whistle. 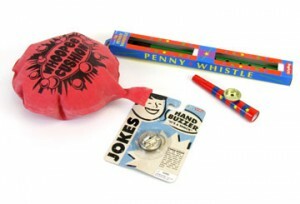 Hand Buzzers and Whoopee Cushions are perfect for your favorite comedian. With so many toys to choose from, you’ll find the perfect gift!